I always liked Hawkeye as one of my favorite Avengers. There is something really appealing about his blue-collar attitude, treating the Avengers like a job. He also currently has a comic that is easily one of the best on the market today. 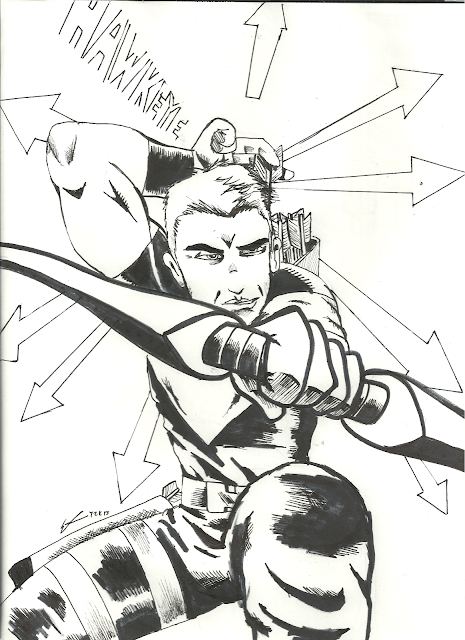 I drew this picture yesterday because I was inspired by an interview with David Aja, the artist on the Hawkeye comic. The way he breaks down a panel or transitions from a sketch to a fully inked page is a sight to behold. Click here for the article. I drew this initially with a mechanical pencil, then inked it over with a G2 black gel pen. After that, I inked it over again using a medium size Paper Mate Flair pen (for thicker lines) and a .01 inch-tipped Millennium art pen (for the really light shading or ultra fine details). And after that, I colored in the shadows with a Super Twin Tip Sharpie marker. I also used the Sharpie to outline certain parts of Hawkeye's body to make it pop more, like his hand. Random Thoughts on "The Last Action Hero"